Ingleborough and Whernside are fine – Yorkshire’s two highest peaks – but Pen-y-ghent has no right to be included in an elite group. Like a weedy kid hanging out with his older brothers, it gets to be part of the gang through its connections rather than its credentials. There are several higher summits in Yorkshire; one of them even shares its name with the biggest sibling. Great Whernside lies on the eastern boundary of the Yorkshire Dales National Park, overlooking Wharfedale and Coverdale. At 704m, it is the 6th highest summit in the Dales (Pen-y-ghent is the 9th) and the usual starting point is the village of Kettlewell. But this route to the top is too quick to really appreciate the hill; it would take three hours at most to get up and down. A more enjoyable option is to walk in from further south along Wharfedale – which also allows you to start from one of the Dales’ most sparkly towns. Gateway to the Dales, Capital of Wharfedale, Grass Vegas … Grassington goes by many names. It’s a tourist honeypot with all the charm you would expect of a Dales village, and people arrive in droves to enjoy the tearooms, traditional sweet shop, museum, park and souvenir shops. It’s an excellent base for walkers too, with a good independent outdoor shop, several good pubs, and a bakery for stocking up on cakes and pasties for the hike. The Dales Way passes through the town, and in summer every other person around the village square a map case dangling off their rucksack. 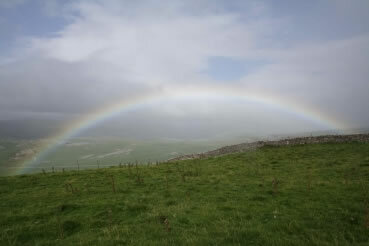 The walk to Great Whernside begins along the route of the Dales Way. Walk up Grassington high street and turn left at the top (look for the yellow arrow marking the Dales Way). But at the first stile (just beyond the large dairy), leave the long distance path and head right. At Kelber, you reach the track that leads to Mossdale Scar. Instinct suggests you should keep heading uphill to reach Great Whernside via Conistone Moor, but a wire fence further up on the moor prevents you from reaching the summit. Instead, turn left along the track at Kelber and follow it downhill until you reach a footpath junction. Here, a path leads you along a footpath via two small plots of woodland (marked New Close Allotments) and then across the western edge of Conistone Moor. Whernside Pasture, a shoulder of Great Whernside, is now in view. Continue along the path beneath this, veering gradually uphill to make sure you come out above the steep gullies at Hag Dyke. The ground is usually boggy and wet – it’s worth giving your boots a fresh waterproofing before setting out. As you reach the moorland just above Hag Dyke, head up the steep slope to the main ridge; the rocky summit, marked by a trig point, is a few steps away. 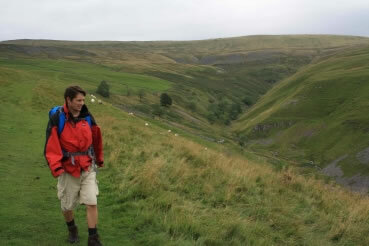 The direct descent to Kettlewell is easy to follow, although it is also very squelchy. The path leads past Hag Dyke hostel, owned by a scout group and one of the highest hostels in England (it’s available for group hire). Beyond here, the path hugs the side of a deep valley complete with sheep, drystone walls and rounded green fells – a warmer picture of the Dales after the relative bleakness of the moor. 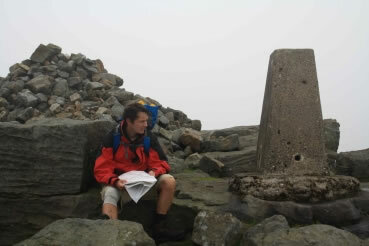 For a longer trip, continue north along the summit ridge over to Coverdale – one of the least-visited dales. 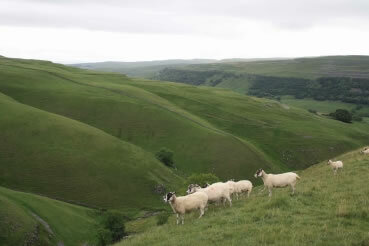 Cross the watershed of the two valleys above Park Gill Beck, and then drop into Kettlewell via Cam Head. Kettlewell competes admirably with Grassington as the star turn in Wharfedale. Our old friend the Dales Way passes through Kettlewell as well; you can follow this for seven miles back to Grassington if you like. Alternatively, sit outside the Blue Bell Inn with a pint and wait for the bus to arrive – the stop is handily located across the road from the beer garden. The choice is yours. There are lots of buses to Grassington, and the DalesBus connects Grassington with Kettlewell. The nearest railway station is Skipton; buses to Grassington leave from just outside the station. Both Grassington and Kettlewell have plenty of B & Bs, and most of the pubs have rooms. The nearest campsite is in Threshfield or book a stay at Hag Dyke hostel. OS Explorer Maps 01 and 02 (the walk requires both maps) or OS Landranger Map 98: Wensleydale & Upper Wharfedale. Easy going, except the walk across Conistone Moor to Great Whernside, which is open moorland and can be boggy.